Denial is a very boring and deceptive movie about a legal case, David Irving v Penguin Books and Deborah Lipstadt, in which British World War II historian David Irving sued American Jewish historian Deborah Lipstadt and her British publisher for libel over allegations made in her 1993 book Denying the Holocaust, in which she accused Irving of being a “Holocaust denier” and a bad historian who distorted history to conform with his ideological agenda, namely the vindication of Adolf Hitler. The evil Nazis and Holocaust deniers, by contrast, are uglied up by the casting department. 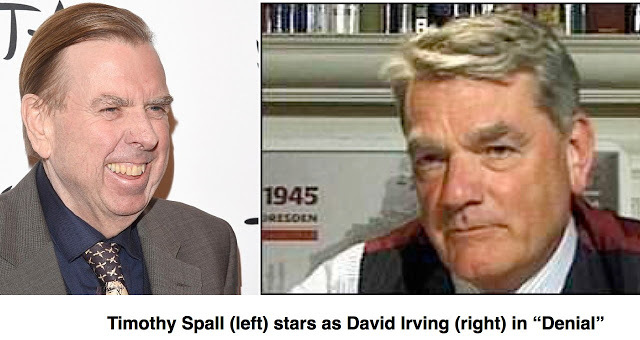 David Irving, who was quite the ladies’ man, is played by a short, chinless, jowly, bug-eyed, thoroughly repulsive actor. The same is done to lawyer Martin O’Toole, who has a bit part (but not to lawyer Sam Dickson, whose name appears as Dixon in the credits). In 1996, Irving filed his libel suit in Britain, where the burden of proof falls on the defendant. Thus Penguin and Lipstadt were forced to defend the truth of Lipstadt’s claims about Irving being a “denier.” And, to gild the lily, they argued that Irving was a racist and anti-Semite to boot. Irving ended up representing himself in court. Little wonder that he couldn’t find an attorney. It was quite possibly the dumbest libel suit since Oscar Wilde sued the Marquess of Queensbury for calling him a sodomite in 1895. It was, of course, child’s play to prove that Wilde was a sodomite, just as it was child’s play to argue that Irving, by any reasonable definition of the terms, was a racist, an anti-Semite, and a Holocaust denier. The real issue, of course, is whether being a racist, an anti-Semite, or a Holocaust denier are necessarily bad things. Irving, like Wilde, apparently wanted the court to rule that he was really not a bad person. But law courts are not the place to seek moral vindication. That is something that outsiders—whether homosexuals or Holocaust deniers—must have the courage to give themselves. The one thing that Irving v Lipstadt did not establish is that Irving is a bad historian, which is probably why the defense focused on racism and anti-Semitism. I followed the trial closely as it unfolded and carefully read historian Richard Evans’ report on Irving’s scholarship. The long list of “errors” adduced by Evans consisted mostly of differences of interpretation rather than matters of fact. Evans and two research assistants went over more than 20 of Irving’s books with a magnifying glass and found only two or three actual errors of fact. One wonders if any other historian could acquit himself as well before such minute scrutiny. Even an amateur like me can find that many mistakes on a random page of William L. Shirer’s The Rise and Fall of the Third Reich. Unfortunately, Irving’s politically incorrect convictions, combined with Evans’ handwaving and quibbling, were enough to convict him in the eyes of the judge who decided the case. It is utterly galling that virtually every account of the trial claims that Irving was “discredited” rather than vindicated as a historian. It is even more galling when one compares Irving’s work to the plodding, unimaginative, clichéd, and conventional writing of his accuser, Deborah Lipstadt. David Irving educated himself, authored more than 20 books, and made a modest fortune by dint of sheer talent and hard work. 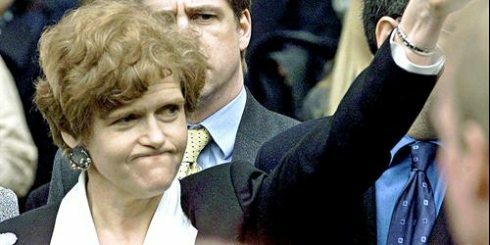 Lipstadt, by contrast, would never have been a professor or an author based on her modest talents alone. She was raised up and propped up by feminism, political correctness, and Jewish ethnic networking. Moreover, Lipstadt’s Denying the Holocaust really is a work of defamation. It is every bit as tendentious as she accuses Irving of being. And Lipstadt was just one player in an organized Jewish campaign to destroy Irving’s reputation as an author because he lent that reputation to the cause of Holocaust revisionism. Ironically enough, Irving was never a blanket Holocaust denier, and the Holocaust was never a focus of his work. But Irving’s historical spadework did raise questions and problems for the mainstream Holocaust narrative. These problems were no threat to honest scholars, but for Jews, the Holocaust is not a matter for scholarship but the object of a religious cult, and, as is typical with offshoots of Mosaic religion, dissenters are not to be tolerated or debated but to be defamed and destroyed, often with the most self-righteous, hysterical, and swinish verbal—and sometimes real—thuggery. In one scene, Lipstadt and Robert Jan Van Pelt decry the desecration of the purported gas chambers at Auschwitz by Fred Leuchter, which rather begs the question, since Leuchter’s whole point was to determine if something sacralizing had occurred there at all. Later they pray over the ruins. It is not hard to see why Irving wanted to squash Lipstadt—and the system that created her—like an insect. But it is hard to fathom the naivete of thinking that he could get justice in a law court. And even if he had won, Lipstadt was just one head of the hydra, whose control over the mass media and academia would have been unshaken. His reputation as an author would not have been restored. Mainstream publishers would not have come courting. Granted, Irving had used lawsuits before with good effect to harass his enemies. But when Penguin refused to knuckle under or settle, he should have dropped the suit before it went to trial. Really, Irving should simply have accepted his downfall, counted his blessings, and continued to write books for the ages, knowing that history would judge him in a better light and that would be the best revenge. But that course proved psychologically impossible. 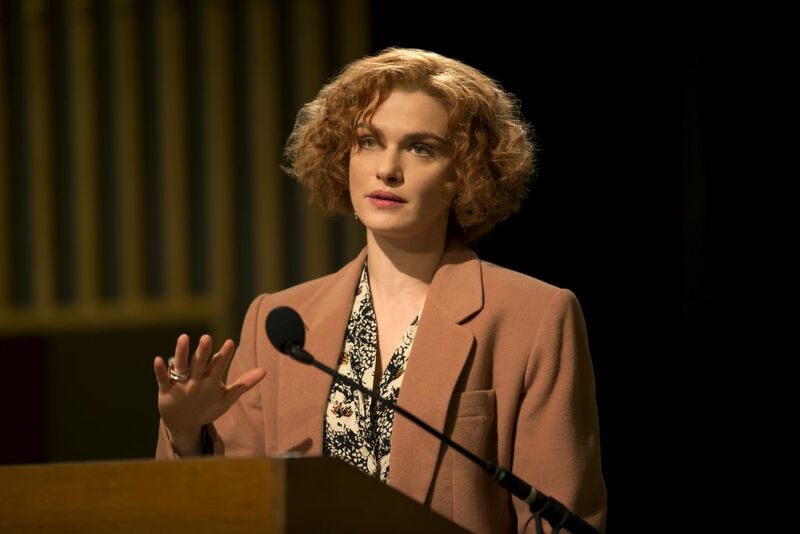 It is odd that not even Rachel Weisz and a sympathetic director and script can make Deborah Lipstadt seem like a likable character. At every step of the way, she kvetches and complains as people do her huge favors. (She must be hell on waiters.) Absurdly, she complains that Holocaust survivors are not being allowed to tell their tales at the trial. In one scene, yet another Jew who was not exterminated by the Nazis portentously rolls up her sleeve to reveal her camp tattoo and asks Lipstadt to promise that her voice will be heard. When I lived in Atlanta, I always fantasized about going to one of Lipstadt’s occasional public lectures and asking her, “Professor Lipstadt, don’t you think it is time for Jews to stop being silent about the Holocaust?” You know very well that she would not say, “Actually, I think we’re doing an adequate job of talking about it.” Really, does a moment go by when somewhere on the planet, some Jew is not remaining silent about the Holocaust? Lipstadt is probably still kvetching today about being misunderstood and unappreciated, having dined out for two decades on her trial, with a book deal, this movie, well-paid speaking engagements, and various awards for her “courage.” It really took a lot of courage to go up against the lonely and reviled David Irving with a six-million-dollar war chest, the mass media, and the full weight of the most privileged and powerful tribe on the planet behind her. Irving has not fared so well. Like Wilde, he was ruined by his folly. Wilde was imprisoned, which broke his health. He died at the age of 46, not long after his release. The world will never read the books that he could have written if he had made a wiser choice and lived a long and productive life. Irving’s case ran from September of 1996 to April of 2000, when the judge ruled for the defendant. Irving was held liable for Penguin’s trial costs (£2 million, about $3.2 million) and eventually forced into bankruptcy, losing his home and access to many of his research materials. Moreover, since his defeat, Irving did not accept his fate, buckle down, and focus on completing his life’s work before death or senility still his pen forever. Instead, he has thrown himself into ever more frantic and sordid attempts to relive his glory years when he was a millionaire author living and traveling in luxury. Irving recorded it all in his online diaries: renting and being evicted from homes he could not afford; increasingly grueling and seedy tours of the United States in rented vans, speaking in restaurants and hotels; rows with waitresses, journalists, protestors, and movement people; creepy stalking behavior directed at young female ex-assistants; his repulsive attempt to shake down a German movie studio for “plagiarism” for using his research on Rommel (you can’t copyright historical truth); being thrown out of restaurants, hotels, and countries, etc. More than 20 years have now passed since Irving filed his fateful suit, but for an author, the true measure of that time is all the books he has failed to write. Irving is almost 80 now. He’s basically wasted the last quarter of his life. He has betrayed his talent, his calling, his readers, and the cause of historical truth. This is a tragedy in the true sense, the story of a man with genuinely great talents undone by a terrible character flaw, in this case overweening vanity now curdled into bitterness. And, sadly, it’s too late to turn things around. 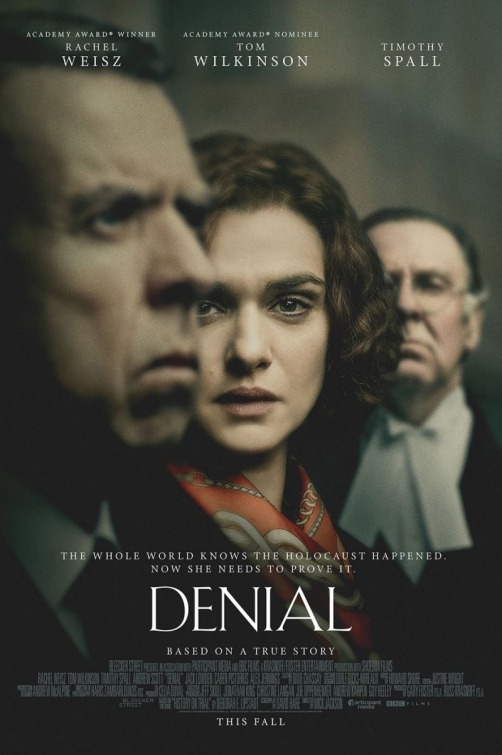 But Denial is not a tragic drama, a movie that evokes fear and pity for David Irving. Tragedy is an Aryan form of literature, after all. Instead, Denial attempts to be an extended exercise in typically Semitic wound-licking, ritualistic denunciation, and gloating over the suffering of tribal enemies. But it fails even in that ugly ambition. In truth, Denial is just portentous, boring, and sometimes unintentionally funny. Skip it, stay home, and read Hitler’s War instead.